But not only have seven weeks gone by since Ban praised President Mahinda Rajapaksa for his “flexibility” and announced his Panel on Accountability would go -- since then, a range of UN officials have acknowledged that Sri Lanka has now refused to let the UN Panel go and speak with Rajapaksa's Lessons Learnt & Reconciliation Commission. 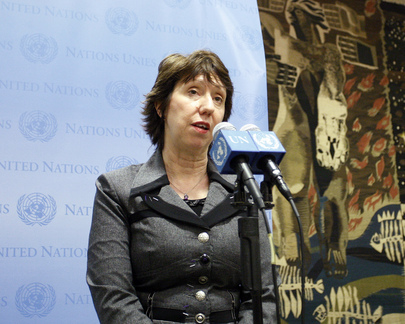 EU's Ashton, Who Cut Sri Lanka's GSP Plus, Says Rajapaksa Blocks Inquiries, While Ban Praises His "Flexibility"
UNITED NATIONS, February 8 -- While UN Secretary General Ban Ki-moon praises Sri Lanka president Mahinda Rajapaksa's “flexibility,” even as Ban's Panel on Accountability is blocked from traveling to Colombo, the EU's Catherine Ashton on Tuesday was more direct when Inner City Press asked her Tuesday about the removal of GSP Plus tariff benefits for the country. 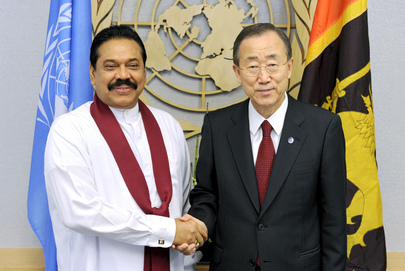 Meanwhile Ban Ki-moon cites a 2005 visit while he was South Korean foreign minister as somehow pushing for accountability, and praises Rajapaksa's “flexibility.” Seven weeks later, with the UN now offering Sri Lanka a mere video conference call, will Ban explain his statements? Watch this site. Inner City Press also asked Ashton about Myanmar. She said she and ASSK are exchanging letters, and that she hopes the EU will be able to send someone to visit her soon, as well as others in the opposition. We'll see.